Proprietary Process for Extracting Purified TA-65™ After more than 3 years of research and development, T.A. Sciences in conjunction with experts in Canada, Hong Kong, and the U.S. has perfected an exclusive method for extracting the naturally-occurring TA-65 molecule from the Astragalus root. We are the first company to isolate TA-65 from the plant. The result of this exclusive, proprietary extraction process is a powder that is over 90% pure TA-65: the potent, Telomerase-Activating molecule*. Footnote: The Telomerase-Activating potency of TA-65 has been independently proven in rigorous tests by The Geron Corporation. First, T.A. Sciences harvests plant material from specifically selected farms in one small region in China. They are then sent to our exclusive plant extraction facility where the raw Astragalus root is chopped up and refined. After initial extraction, the base ingredient is further purified and then sent to an outside government testing facility where it is tested for purity, heavy metals, and pesticides. Then this base material is sent to T.A. Sciences’ contracted laboratories in Canada. Each shipment is accompanied by a verified Certificate of Analysis, ensuring the identity and purity of this material. The Canadian laboratory is a modern state-of-the-art facility certified to produce drugs to FDA standards. There the base material is further processed to yield the single TA-65 molecule. After being refined to over 90% purity, each batch goes through a final inspection, using a proprietary, patent-protected assay exclusive to T.A. Sciences. 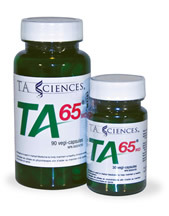 TA-65® has been in use since 2005 with not one reported adverse event.